With aging the skin droops and develops wrinkles, lines and furrows. The severity of these changes in an individual depends on genetic tendency, skin phototype (amount of pigment on the skin) and exposure to environmental factors. Facial lines and wrinkles (rhytides) form because of the following factors: aging processes, sun damage, muscle movement, gravity, smoking, skin injury, surgery, acne and other skin diseases with a tendency to scar (e.g., discoid lupus). There is often a degree of asymmetry to the lines, as people tend to smile or frown more on one side than the other, or consistently sleep on the right or the left cheek. Deeper lines or furrows are classified as dynamic or static. Dynamic lines appear with movement (i.e., the activity of facial muscles). Static lines are unchanged with muscle movement. Eventually dynamic lines become static. Frown lines between the eyebrows are due to contraction of corrugator supercilii muscles and procerus muscle when concentrating or angry. At AgeFocus MedSpa a trained esthetician will make a good assessment and determine your specific needs. A Skin Complexion Analysis is available for clients looking for facial rejuvenation procedures. The system captures digital photos (RGB and UV light) of the face and measures sun spots, pigmentation, pores, roughness, acne, moisture and wrinkles. 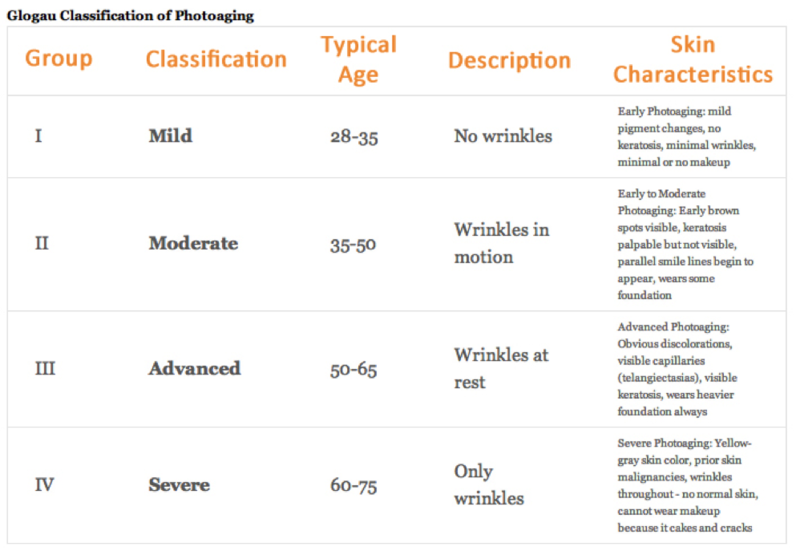 A report of skin age and type of skin (see picture) is given. This will help plan treatments, and, most importantly, compare the skin changes after skin rejuvenation treatments are done. A complementary physician evaluation is also always available to determine if any other treatments are indicated. Sunscreen Lotions: They are ideal to prevent skin damage. We prefer physical sunscreens (zinc oxide and titanium dioxide) over chemical ones. Make sure that the product is SPF 30 or above, that it is effective blocking the UVA and UVB rays, and it is water resistant. Moisturizers: They are a complex mixtures of chemical agents specially designed to make the external layers of the skin softer and more pliable, and they increase the skin’s hydration (water content) by reducing evaporation. 1. Semi-Occlusives: These work by forming a thin film on the surface of the skin to prevent any loss of moisture. 2. Humectants: These attract water from the air to moisturize the skin. 3. Restoration of Deficient Materials: These are more complex, and they try to restore natural moisturizing factors on the skin such as amino-lipids. Moisturizers prevent and treat dry skin, protect sensitive skin, improve skin tone and texture, and mask imperfections. They are also used to prevent the skin from becoming too dry or oily. Using the right moisturizer recommended by an experience esthetician is very important. Anti-Aging Formulas: These include antioxidants and exfoliants, especially retinoids. Resurfacing: These include chemical peels, dermabrasion and laser resurfacing. This laser treatment is the one that shows the most impressive results. At AgeFocus we use IPL and fractional laser (ablative and non ablative). Fillers: They can fill individual lines (see our Restoring Volume Loss section). Neurotoxins: They are most useful for dynamic lines. It can be used to “weaken” the muscles that are responsible for frown lines, crow’s feet and forehead lines. Fine wrinkles disappear, deeper wrinkles become softer and barely visible. It can also be used to change the shape of the eyebrows, to soften so-called smoker’s lines around the lips, and to reduce appearance of neck lines among other uses. This is an FDA-approved cosmetic that is used for the temporary improvement of moderate to severe facial lines. “Toxins” are done by injection and can last three to six months. Xeomin and Botox are used in our practice for the correction of facial wrinkles. Most people tolerate it quite well. If Botox or Xeomin side effects do occur, in most cases, then they are minor and either require no treatment or are easily treated. Local spread of the medication may cause weakening of adjacent muscles, although this is rare. Occasional mild skin redness or even bruising is possible. Due to the fact that the neurotoxin needs to bind to the nerves, the “muscle relaxation” is gradual, usually starting being noticeable two to three days after the injection, with full effect seven days later. We feel that in our experience Xeomin has a faster onset of action. The duration is similar for Botox and Xeomin.